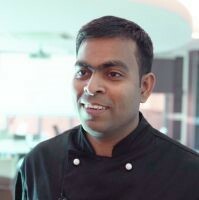 Meet our Head Chef Sathish Kumar, who leads a team of seven chefs. We strive to continually develop skills and grow knowledge among the SwanCare team. As part of this focus, Sathish recently travelled to the Barossa in South Australia to take part in the 'Creating an Appetite for Life' education program run by renowned cook, author and restaurateur Maggie Beer. As part of the Maggie Beer Foundation, the program’s vision is to ensure that all residents in aged care are provided with fresh food and flavour - a vision that perfectly aligns with Sathish’s passion in the work he does.